Lately, I've been having numerous conversations about using cards with little (or no) prior experience. 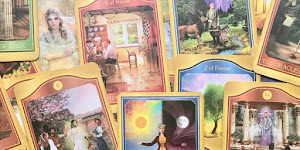 Unlike more traditional Tarot, which is structured, deeply symbolic, and generally requires a fair amount of study to be able to read effectively, I believe that it's unnecessary to have prior knowledge of a good Oracle deck to be able to come up with a useful reading from it. Especially if you're using a spread (which will specify what each card is 'talking' about) and a deck with useful words or pictures - i.e. the vast majority of oracles. Regardless of whether your interpretation is the same as the author might have intended, if you are able to get a meaningful message which makes sense to you (or the querent) then your cards have done their job. This is the nature of intuitive reading. 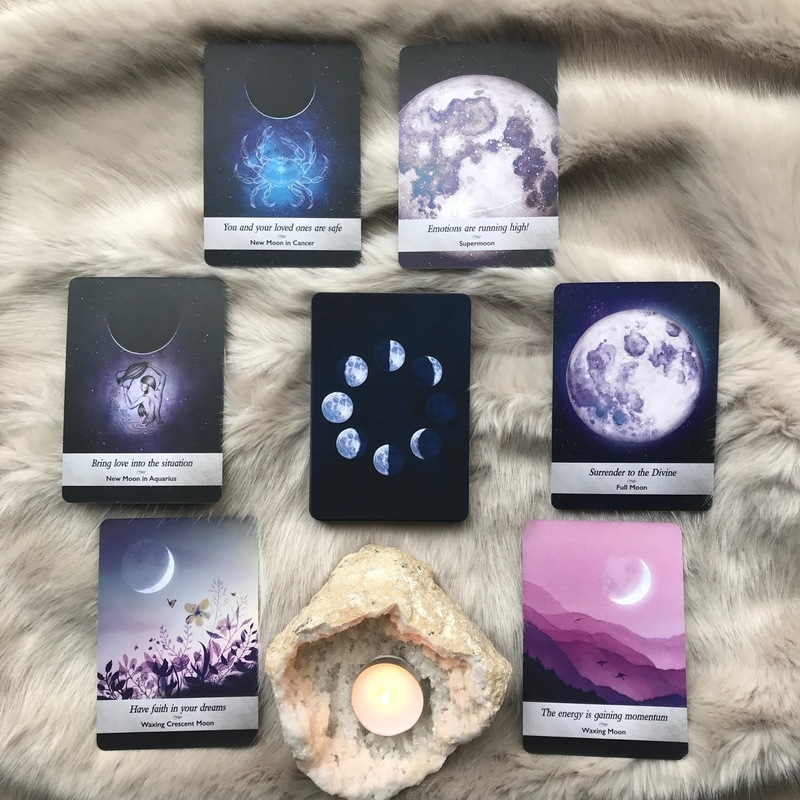 Using my Full Moon Eclipse in Leo spread and the Moonology Oracle Deck by Yasmin Boland, I conducted a sample reading to show you what I mean. I haven't read the book that accompanies this deck, and I know next to nothing about astrology. 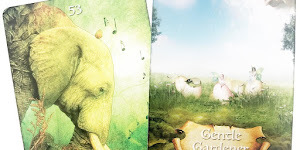 I am not familiar with the structure of the deck or whether there is any correlation to the archetypes that might be found in others, so my reading is solely based on my intuitive response to the words and images. The following six questions are the 'positions' specified in the spread. The bold text following each question is the wording printed on the card that was selected in that position. Further text is my interpretation of the card in response to the question. 1. How can I stay open to the lessons of the cycle? (New Moon in Cancer) You and your loved ones are safe. When you are defensive - even if it’s an unconscious thing - you become hardened and close yourself off, protecting your perceived vulnerabilities like a crab in his shell. On the contrary, when you have faith and trust that you and those you care about are safe, there is no need to worry, stress or feel threatened. This gives you the freedom to remain open-minded, in receptive mode, and free to perceive the lessons (and growth) that are available to you at this time. 2. What hidden aspects are coming to life? (Supermoon) Emotions are running high at this time. 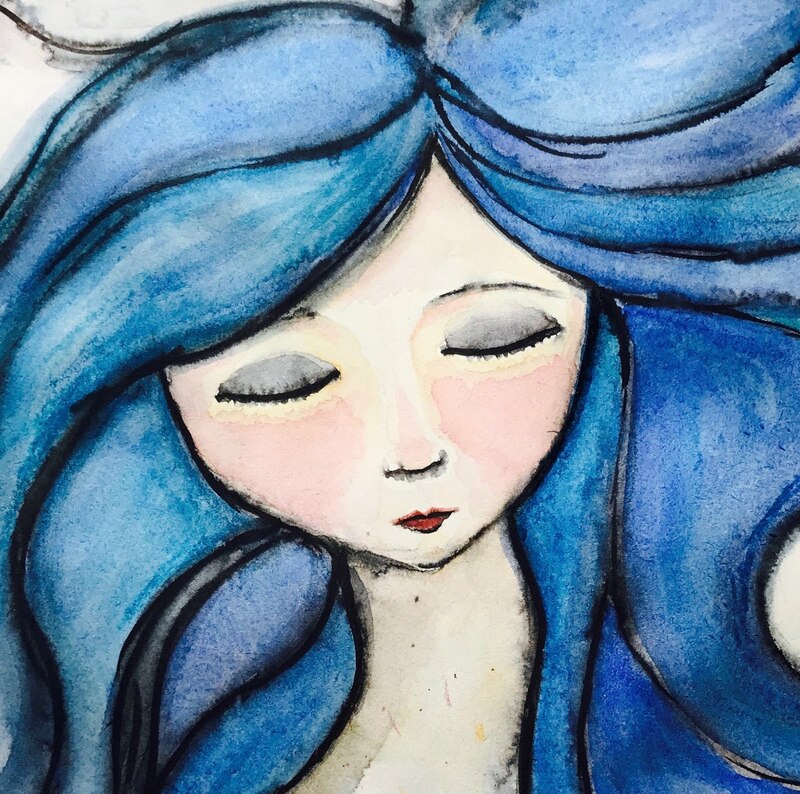 As much as you might normally like to keep a lid on things, or to keep the peace, there are certain times when your emotions need to come to the surface anyway. When they do, try to notice and observe them arising - without judgment - and to consider what has triggered them. This will indicate whatever needs to be healed. Just as the supermoon illuminates the earth, take this as your opportunity to see more clearly and use it for the benefit of yourself and all involved. In this sense, enlightenment is available... if you can keep your emotions in check! 3 . What challenges might I need to face? (New moon in Aquarius) Bring love into the situation. Challenges inevitably cause us to feel fearful, and we’re likely to want to retreat back into that shell, ie to get defensive and closed off. The antidote to fear is love, but that in itself can be a challenge and one that you might find yourself facing this month. If so, it's important to remember that you ALWAYS have a choice, and in any moment you can choose love, regardless of the circumstances. When you do, and you align with your heart-space, you will find that your decision-making becomes so much easier, and 'challenges' will cease to be. 4. How should I manage my heightened emotions? (Full Moon) Surrender to the Divine. This card speaks for itself, but if any clarification is necessary, it can be only this - when you fully trust that you are divinely connected to all that is, was, and ever will be, you also know that there is nothing to fear. Your heightened emotions and any upset they seem to cause you will be seen for what they are - illusory. As before, notice when these emotions arise, see what can be learned from them, then thank them and let them go. 5. How can I balance my needs with those of others? (Waxing Crescent Moon) Have faith in your dreams. When you have surrendered to the Divine and have faith in your dreams, it’s possible to release your attachment to outcomes because you will recognise the infinite nature of abundance. When you know that everything you need is available to you, and that the same is true for others (if they choose it), there need not be any conflict. In the beautiful image on this card, there is an effortlessness in the co-existence of the butterfly and the other bugs who are all attracted to the same flowers - it can be the same for you and those around you. Conflict is but another name for fear - replace that with love and you’ll find things will flow. 6. Where should I focus my energy at this time? (Waxing moon) The energy is gaining momentum. If you take the time to notice birds in flight, you will see that they use the invisible airstreams around them to their advantage. They flap their wings when they need to, but a lot of the time, they appear to be gliding effortlessly through the air. The momentum keeps them moving with ease. This enables them to make the best use of their energy. It also looks like fun! 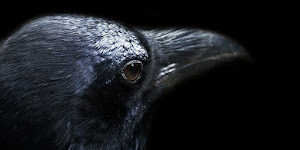 Birds navigate using their innate sense of direction, sometimes travelling for thousands of miles. There is much to be learned from this. When you listen to your internal-GPS (your intuition), and work synergistically with the circumstances you find yourself in, you too will find that you can move forward with ease and grace. While it’s good to know your destination, don’t become so fixed on it that you fail to enjoy the journey or to take advantage of anything that might make getting there a whole lot easier on yourself! Let your energy guide you, rather than directing it in a pre-determined direction. So that was my reading. 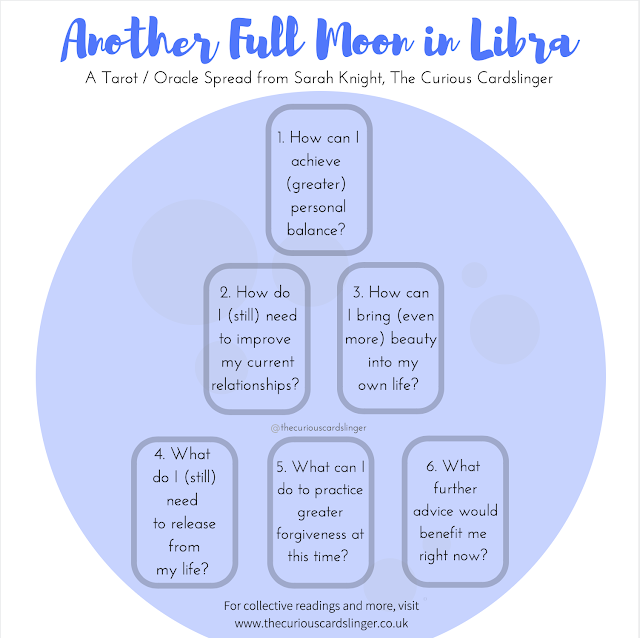 If I knew about astrology / moon phases and had learned more about the intended meanings of these cards, it might have been quite different, but as it stands it both resonates and makes sense. (Do you notice the cards even tie-in with the positions in the spread to provide a cohesive flow? E.g. heightened emotions came up as the answer to question 2, and linked neatly with question 4.) These cards were drawn with my own situation in mind and each one brings up something I really relate to. Although I already had all the answers (they came from within me) I wouldn't have ever really asked myself these questions without doing the reading. This is one of the reasons I like to check in with my new- and full-moon spreads each month. They provide the opportunity to step back and evaluate what's going on. When I was new to card-reading, I was (overly) concerned about learning 'meanings' and trying to fit them to the questions. I was always referring to the book! Now, my advice to new oracle readers would be to act like the birds in card 6 - relax and flow with the information you get when you look at the cards. Your intuition will guide you to the interpretation you need, you just have to trust in it! If you have cards and would like to give this spread a try, you can find it here. Alternatively, if you'd like to purchase a personal reading using this spread which will be sent directly to your inbox, please go to www.intentionalhealing.co.uk/readings. You can request these cards for a fully intuitive reading, or a deck that I'm more familiar with!